A sale pending sign is posted in front of a home for sale. The median price of a home in Southern California surged 6.4 percent in June from May to the highest level in 30 months. The La Jolla-based real estate tracking firm MDA DataQuick says the median price in the six-county region rose to $265,000 last month, an increase over the May figure of $249,000. 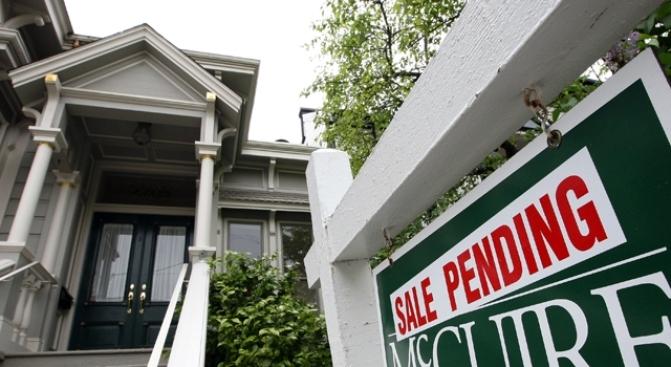 The price is still down 26.4 percent from $360,000 a year ago. DataQuick attributes the jump to an increasing number of deals above $500,000, as buyers responded to price cuts and found it easier to secure financing. DataQuick says more than 23,000 homes closed escrow in June, an increase of 12 percent from May and 29 percent from a year ago. Foreclosures comprised 45.3 percent of resales last month, down from 49.7 percent in May.